The Best Dental Floss - how to pick the right one. To find the best dental floss, I have spent over 30 years trying out all the different kinds of floss on the market. I have tried just about every single dental floss available in each of the five countries I have lived in! But remember, the best floss is the one that YOU find works in YOUR hands. Don't just take our word for it! Ideally you should go out and get several different types of floss, and try them all out for yourself. Reach (by Johnson & Johnson) have a range of floss that includes unwaxed and waxed floss, woven floss, and ribbon tape. The ribbon tape is my favorite Reach product. However it is not as "flat" as other tapes, and feels quite thick. This means that it breaks less often, but is harder to get through tight teeth contacts. a standard dental floss. This is a straightforward floss that does the job. It's not especially shred-resistant, nor thin, so it's most useful to people who don't have a problem with tight teeth. available in 3 thicknesses. This is one of only two flosses I know of that you can get in BLACK, to contrast with the plaque. I don't know enough about this floss to recommend it. But I like the fact that you can get it in 3 thicknesses. You just have to try them out to find which one works best for you! This is a special "3-in-1" floss. It comes in individual ready-to-use sections. One end has about 3 inches of stiffening in it. This is ideal for threading the floss under bridges or between teeth. The next 8 inches is a frizzy woven section. The final 12 inches or so is normal floss. This is the only floss I am aware of that has its own built-in threader for bridgework. But if you DON'T have bridgework, use a normal floss or tape. You can also get Oral B Super Floss at Amazon! a woven type of floss. This floss appears a little thicker at first, but has a soft texture. If you pull it, it gets thinner! So you can pull it tight to make it really thin, slide it between 2 teeth, then relax the tension to allow the floss to expand again and fill the space between the 2 teeth for better cleaning. 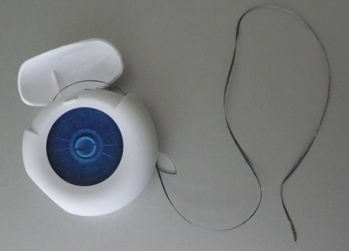 You can read more about the different types of woven dental floss at Woven Dental Floss. You can get GUM Expanding Floss at Amazon. Blaque Dental Tape. This is a recent entry to the flossing market, and one that I have been testing personally against my other favorites. I think it's a great candidate for the title of "Best Dental Floss". In the picture below, you can see that it has a dark, almost black, color! This dark color means that you can see the plaque on the tape as it comes off your teeth. Unfortunately there are major supply problems with Blaque at the moment (mid-2018). Once production is back on line, I'll post a link to get it. Oral B Satin Tape. (waxed). This like a ribbon or tape, and is one I really like. Most of our patients seem to get on well with it, too. This floss is very thin, because it's a tape, and it slides between even very tight teeth easily. BUT it's also resistant to shredding. Find out more about this floss at Oral B Floss. You can get Oral B Satin Tape at Amazon. THE BEST DENTAL FLOSS in my opinion is currently Oral B Pro-Expert Floss. It is actually a tape, like Satin Tape, but I find the texture is much better. If the Pro Expert snags on something, it will snap cleanly. No shredding nor getting jammed! It also comes back out from between your teeth with minimal force on your teeth, fillings and crowns/veneers. It comes in a 40 meter roll, which is much longer than the usual 25 meters from other manufacturers. You can read more detail at my page Pro Expert Floss. SO MY WINNER is Oral B Pro-Expert floss, available at a great price from Amazon. I hope this review of the different makes of dental floss has been helpful. In the end, the best dental floss is an individual choice. You have to find the one that works best for YOUR teeth. Hopefully we've pointed you in the right direction! Whatever floss you use, you will be helping to reduce gum disease and therefore the other general medical conditions that are associated with gum disease!